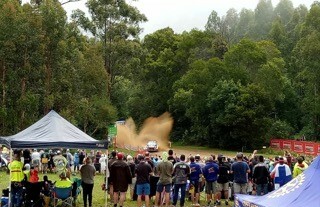 Over the weekend of 18/19 of November we conducted a BBQ at the World Rally Event in Coffs Harbour. A large number of our members andtheir partners as well as Rotarians from other clubs and exchange students manned the BBQ on Friday and Saturday nights at the Super special stage around the harbour. The team then had a long day out at the Wedding Bells forest that also kept them very wet at times as well as busy. We have had a good result which bodes well for our projects that we have in mind and are looking to fund. Thanks to all who attended and supported us.